TANK! TANK! TANK! 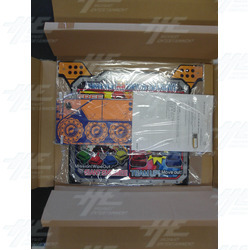 Power-Up Kit is for the Bandai Namco "TANK! TANK! TANK!" game machine to enable delivery of even more fun to our customers. For conversion procedure: Please follow the provided "TANK! TANK! TANK! "Power-Up Kit Assembly Manual. It takes roughly 40 minutes to perform the conversion procedure per a machine (2 seats). TANK! TANK! TANK! Power-Up Kit is for the Bandai Namco "TANK! TANK! TANK!" game machine to enable delivery of even more fun to our customers. For conversion procedure: Please follow the provided "TANK! TANK! TANK! "Power-Up Kit Assembly Manual. It takes roughly 40 minutes to perform the conversion procedure per a machine (2 seats).